Where is the iTunes backup file on your computer? Running iTunes on your Mac may have been a daily work for you, and you know that iTunes can automatically generate a backup for your device. You can restore your iPhone from the previous backup any time you want. However, many users don't know where the iTunes backup file is located on their Mac. If you're one of them, don't worry, here is the location of iTunes backup files on your computer: ~/Library/Application Support/MobileSync/Backup/. Finding the backup file doesn't mean you've really got it. In order to protect personal privacy, iTunes backup is a kind of SQLITEDB file, which doesn't allow anyone to access or preview. You only can restore the whole content to your device, single SMS or contacts not permitted. If you want to access it, there is still a way. You need a tool that enables to extract all contents from the iTunes backup file. Where is the software? 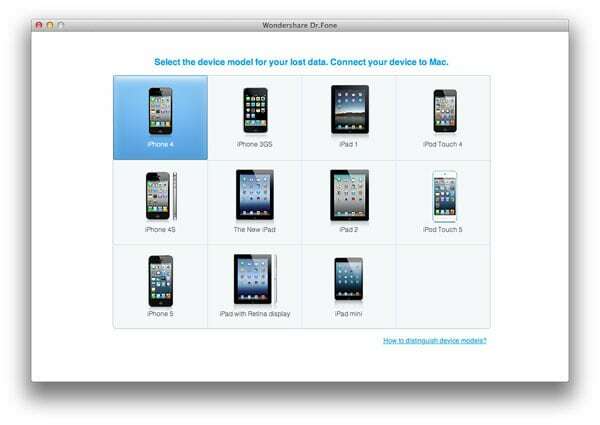 Here is my recommendation: Wondershare Dr.Fone (Mac) or Wondershare Dr.Fone for iOS (Windows). 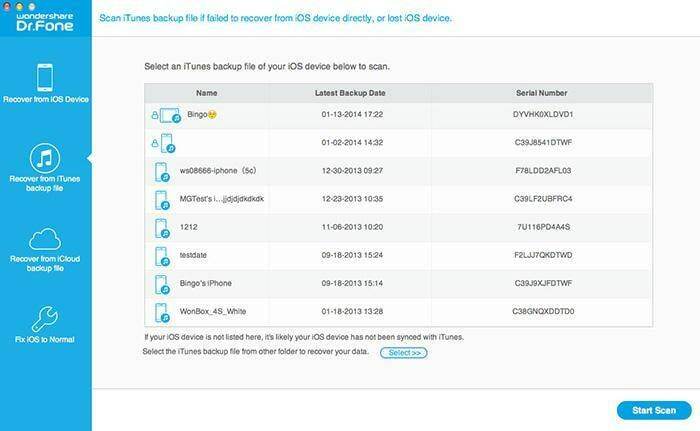 It empowers you to view all details of your iTunes backup content in 2 steps. Both of them work well with iPhone 5, iPhone 4S, iPhone 4/3GS and other iOS devices. Download the trial version of this program below and then install it on your computer. 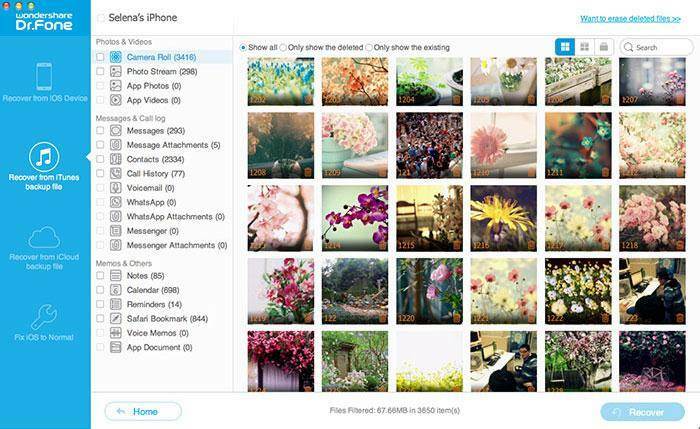 Here take Wondershare Dr.Fone Mac as an example. If you're running Windows on your computer, download the Windows version and take similar steps as follows. Launch the program on your Mac and you'll get the primary window below. Please select the right model of your device. Then you can select "Recovery from iTunes backup file" mode. Here all your iTunes backup files will be found and displayed. Select the one you want to view and hit on "Start Scan" to get the details. After the scan, all files in iTunes backup are extracted including camera roll, photo stream, contacts, messages, and so on. You can preview all files in original state as you like. Then choose them and click "Recover" to save them all on your computer as readable files.